These maybe the last celebrity tomatoes you see coming from my garden. The gray mold is doing a number on the tomato plants. One plant is marginally healthier than the other one, but given how poorly the other plant is doing that's not saying much. I sincerely doubt any of the remaining fruit on the vine will ripen before the fungus gets them. I think I'll just pull them out and be done with it, there's always next year. 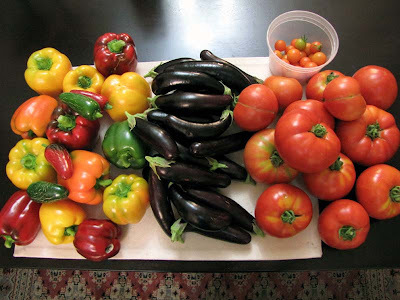 In contrast, the eggplants and peppers are doing great, I wish everything were so easy care for. I've had minimal fruiting as well. Right next to setting fruit, many of the flowers didn't set fruit, shriveled and fell off. I had been attributing this to lack of pollination, but I was just guessing. I think flowers dropping from lack of pollination look different from when they are affected by gray mold. My flowers would shrivel to a small, dry, brown mass, but still stay on the vine.